Would Renoir’s Luncheon of the Boating Party have the same effect on its viewers if it didn’t take up nearly an entire wall at 51 x 69 inches? Conversely, would Jacob Lawrence’s panels from The Migration Series be so poignant if each were triple the size, Panel no. 1 measuring only 12 x 18 inches? In art, size matters. It can make a large piece overcome you. It can force you to inspect a smaller piece more intently than you might if it were just little bit bigger. One of the smaller paintings and one of my favorites in The Phillips Collection is Arthur Dove’s Waterfall, measuring only 10 x 8 inches. This oil painting done on hardboard could escape you if you were walking through the galleries quickly, but it is a work worth a closer look. 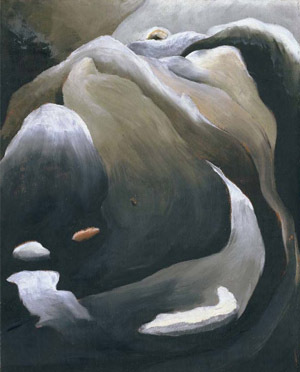 In a typical Dovian way, a style shared by other members of the Alfred Stieglitz circle including John Marin and Georgia O’Keeffe, a natural subject is abstracted in a way that does not immediately depict its title. But as the title indicates, it is a waterfall, a subject found in the nature around us that, when you think about it, does not really have a typical look to it. Not all waterfalls look the same, and Dove is aware of this phenomenon. Dark grey blues swirl into beige washes with highlights of white put carefully on top. The surface is loaded with painterly texture and monochromatic gradients. What the painting captures is a moment in time, the moment you forget what you’re looking at and see only the colors and shapes that make up the nature in front of you. If we could only ask Dove, why so small? Why is it that the artist chose to depict such a grandiose subject in such a small window? Perhaps it is precisely for this irony. It is at once artful and emotional to represent a subject that takes up so much space in the world around us and impose it onto a surface that only takes up a fraction of a gallery wall. The unique smallness of Waterfall is what drew me to the piece in the first place, intrigued by its placement amongst larger O’Keeffe and Marin works that I could spot from the gallery next door. When I took the time to really look at the painting, it instantly became one of my favorites, and that was because of its size. So size in art really does matter, and sometimes, smaller is better. This entry was posted in Congenial Spirits and tagged Arthur Dove, artistic practice, georgia okeefe, goergia okeeffe, John Marin, painting, small canvas, small paintings. Bookmark the permalink. Another reason to visit artworks in person. Pieces such as the “Mona Lisa ” or “Girl with the Pearl Earring” conjure up images to match their “larger than life” fame , when in fact they are quite small. Size is a carefully chosen way to communicate the intimacy or grandeur of the artists expression.